Marie Bernarde Soubisrous was born on 7 January 1844 to a miller, Francis Soubisrous, and his wife, Louise Casterot. She was the eldest of six children and was known to her family and neighbours by her pet name of Bernardette. During her childhood the family sank gradually into dire poverty, and by her teens lived in an airless one-room basement. Bernadette was small and sickly, afflicted by asthma and other ailments, having also fallen victim to cholera in the epidemic of 1854. She was also considered intellectually dull and by 1858 – when she was 14 – she had still not made her First Holy Communion. That year, however, both her own life and that of Lourdes, the French Pyrenean town where she was born, were to change completely. The doctrine of the Immaculate Conception – that Our Lady was conceived in a state of natural justice rather than with the stain Original Sin – had been defined as dogma by Pope Pius IX just four years earlier. At first, people were sceptical and local clergy came under suspicion of putting words into the mouth of Bernadette. Her parents, teachers and priests later testified that they had never mentioned the phrase “Immaculate Conception” to her. Indeed, the girl clung to the authenticity of her experience. She was sincere, calm, humble and steadfast. By March 4 the crowds accompanying her to the grotto had grown to about 200,000 people. The Lady told her to build a chapel at the site of the spring, to which pilgrims could come in procession, and wash in, and drink from. This opened in 1862 and by 1870 Lourdes was the most visited pilgrimage destination in Europe, thanks largely to the spread of the railway. The Lady had not promised cures for the sick but pilgrims began to bring their sick with them and nearly 70 inexplicable healings have been recorded in the last 150 years. Once the apparitions had ceased, however, St Bernardette was unable to find the peace she craved and she hated the publicity that her experiences had brought her. She boarded with the Sisters of Charity at a hospice for five years until in 1866, at the age of 22, she was accepted as a novice in the convent of the Sisters of Notre Dame at Nevers. There, in religion she adopted the Latin forms of her names – Maria Bernarda – and stayed at the convent until she died, not leaving even to attend the opening of a new basilica at Lourdes in 1876. According to Butler’s Lives of the Saints, she was unwilling to draw attention to herself in any way, seeking instead “straightforward holiness of a religious through obedience to the rule of her order” and by dedicating herself to a life of prayer and devotion. She saw herself as someone who had been used by God in an extraordinary way before she was “put back in my corner”, like a broom, and was happy to stay there. 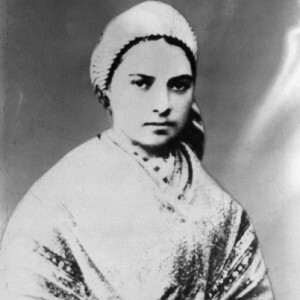 Although St Bernadette was happy in Nevers her health continued to deteriorate and she received the Sacrament of the Sick within four months of arriving at the convent and also a dispensation for her to take her first vows. Tuberculosis of the bones added to severe asthma but she bore all her sufferings with great patience and resignation for the sake of the “heart of Jesus with all its treasures”. She suffered grievously from further complications before she died on 16 April 1879 at the age of 35 years. When her body was exhumed in 1909 it was found incorrupt, preserved from decomposition. Bernadette was beatified in 1925 and canonised by Pope Pius XI as St Maria Bernarda on 8 December 1933, the Feast of the Immaculate Conception. Today, Lourdes continues to attract about five million pilgrims ever year.